Optix Clean™ is a non-alcoholic, non-flammable cleaning liquid formulated to be completely safe for all multi-coated optical surfaces. Optix Clean™ is a non-residue, streak-free, fast evaporating liquid with superior cleaning power, advantages that sets it apart from all other existing cleaners. It easily removes oil and finger prints from all optical surfaces such as; binocular lenses, smart phone screens, telescope lenses, computer screens, camera lenses, mirrors, LCD screens, flat screen TVs and eyeglasses. The components of Optix Clean™ remove static charge build up from all optical surfaces, therefore, preventing dust build up in the future especially on hard to reach areas. Optix Clean™ is more effective when used with the Visi Clean™ Microfiber Cloth from Visibledust. In case of contact with eye, immediately flush eye with water for 15 minutes. 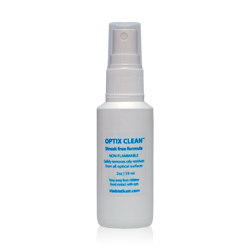 Optix Clean™ is also available in Optix Clean™ combo that includes everything for cleaning camera lenses, viewfinders, binoculars, telescopes, computer screens, LCD Screens, eyeglasses and other multi-coated optical surfaces.